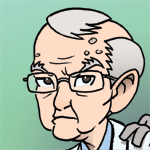 Dr. Grey is a famed roboticist that has been around for many years and has grown older in the public eye (unlike his assistant Venus). It may be a surprise to find out that the good doctor is in fact a small grey alien in a sophisticated robotic body. What designs does Grey have in store for Earth? How does Dr. McTaggart’s research play a role?